Coming to Ravelry 03.28. 15% of all sales will be donated to Planned Parenthood! Old Rusted Chair kits available here! My perfect spring top has finally arrived to Ravelry! 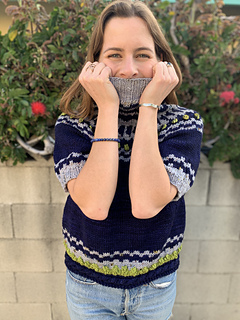 Grab your pattern today and knit up this cute turtleneck that features cable knitting, bobble stitches and stranded colorwork with a totally unique sleeve construction. 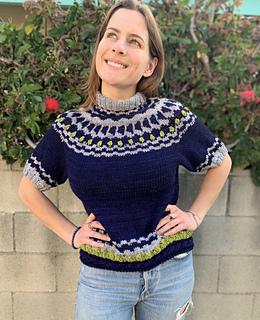 In honor of the amazing dyer behind this sweater, Lauren of Old Rusted Chair yarns, we are donating 15% of every pattern sale to Planned Parenthood. Lauren allocates all of her free time to volunteering for the vital organization. We could think of no greater way to honor her than by making a donation to an organization that saves lives every day! Read more about Lauren’s experience working with PP here. Garment has an a-line fit for ease.